U2's new four-minute music video for "Hold Me, Thrill Me, Kiss Me, Kill Me," featured as the concert intermission on the Experience + Innocence tour, is a most-welcome, highly entertaining update of their original music video released in 1995. The song itself, which U2 started composing in 1993, is an homage to Harry Noble's "Hold Me, Thrill Me, Kiss Me," written in 1952 and recorded by many female artists since, though Mel Carter’s 1965 recording is the best-known version. 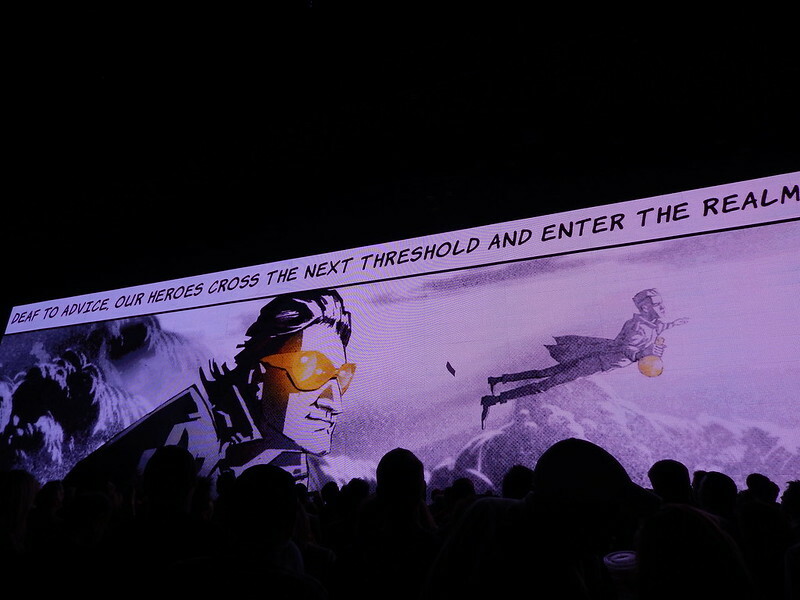 U2's new 2018 video, dubbed "Innocence And Experience: The Heroes' Journey," is just about one of the finest specimens of what the U2 creative team can cook up when it makes pop art. I'm not going into any deep analysis of it here right now. Rather, I am just admiring it and offering my respect. Thank. You. 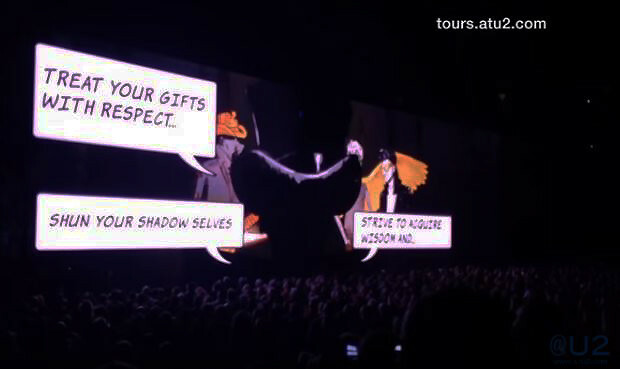 Well ... and this, too: As we've seen before, when U2's team does pop art, they show how conscious and deeply informed they are of the long-running cultural traditions and conversations their new piece will join. It's not often the result signals to us as directly as it does in this new video, but we're being guided by several references here. 4. 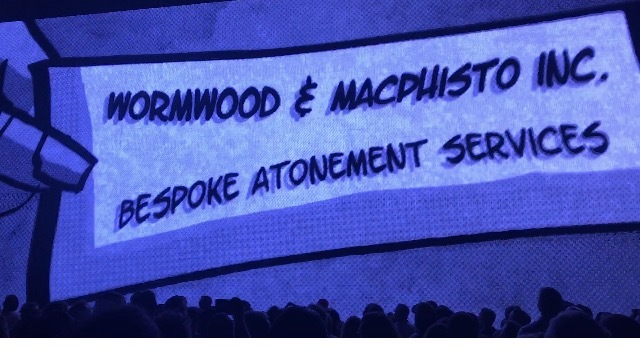 The mysterious stranger, who has rescued the lads from what looks like a refugee's makeshift raft in the ocean, offers his calling card, announcing he's in the business of "bespoke atonement services." Here we have references to C. S. Lewis' The Screwtape Letters (1942) and Christopher Marlowe's Doctor Faustus (1592) as it has been transmitted through several other works, notably Goethe's Faust of 1790, which has in it the demon named Mephistopheles. 5. The mysterious stranger gives them gifts and the advice to "shun your shadow selves," a reference to the Shadow Man in Flannery O'Connor's Wise Blood (1952). 6. 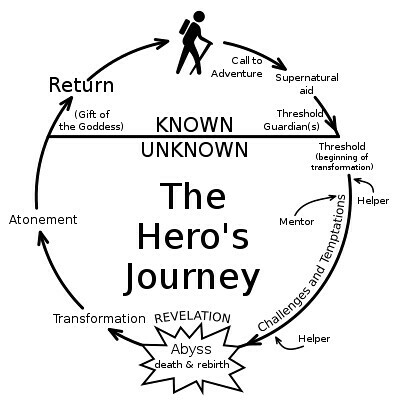 The heroes launch out and "cross the next threshold": another reference to Joseph Campbell's understanding of the journey a hero must take. 8. The stranger replies by quoting David Bentley Hart's maxim as offered in his book The Experience Of God: Being, Consciousness, Bliss (2013). I don't think it's a coincidence that Hart uses the word bliss in his book's title, as Joseph Campbell said his general advice to others was to "follow your bliss." 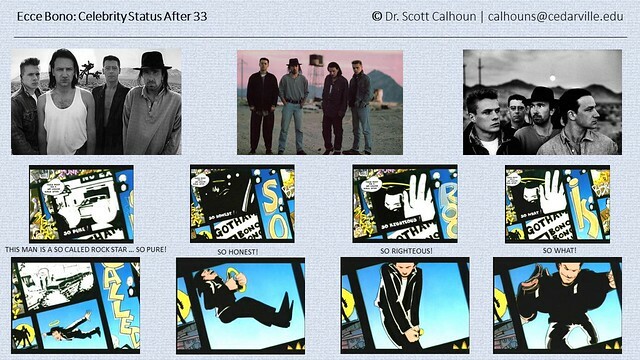 The video ends with the stretch car dropping U2 off for their next show with a tantalizing "to be continued" message. With so many allusions in this video, U2's team manages both to suggest a way to receive the message and still invite us into a mystery. How helpful was this stranger, really? Did U2 gain wisdom? What is the next journey for our heroes? 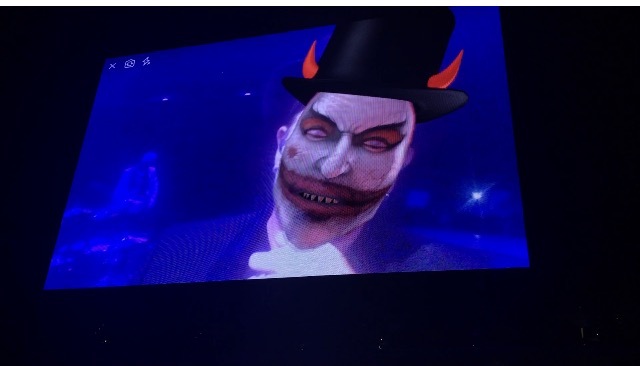 When examined in the context of the second half of U2's actual concert, when MacPhisto makes his 2018 return with a nod to the cosmetics for Heath Ledger's the Joker in The Dark Knight, we are challenged even more so to sort out what this art is all about and what U2 would ask us to examine about ourselves. MacPhisto is back for his silver anniversary and it's wonderfully chilling to watch him perform "Acrobat." 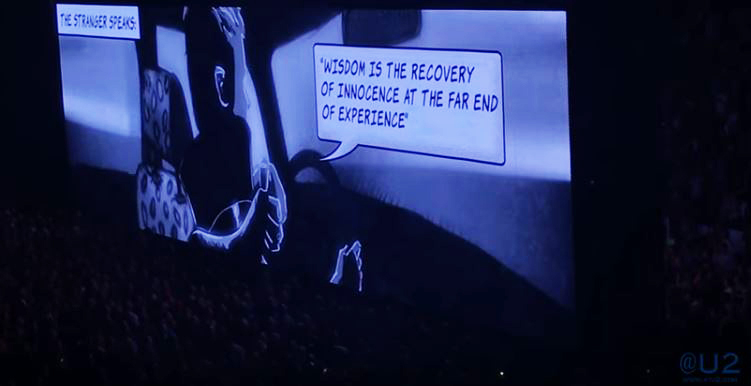 That, combined with his mention on the calling card for “The Heroes’ Journey” video, suggests U2's interest in mocking him once again; and yet, and yet ... there is neither irony nor sympathy in Bono's performance of "Acrobat," and the new video suggests he's been an instrumental part of our heroes' journey, if only to give them the experiential learning of how fraudulent a "bespoke atonement service" company is. There isn't sympathy for MacPhisto, but by invoking him again in the new video, I wonder if there is an even more unsettling message in all of this? Is U2 indicating he's necessary for gaining wisdom? Are acts of betrayal part of the journey of experience? And for us, the audience, is U2 asking us if we have made them into our own bespoke guide across the threshold? In 2015, I made a presentation on "Ecce Bono: Celebrity Status After 33" at the Fandom and Religion conference held at the University of Leicester because I was interested in discussing the riddle U2 presents in the 1995 music video and, more pertinently, in U2's career, which has been inextricably wrapped in the riddle of Bono himself. The riddle is how much can someone (or a band) help someone else without at least one betrayal? 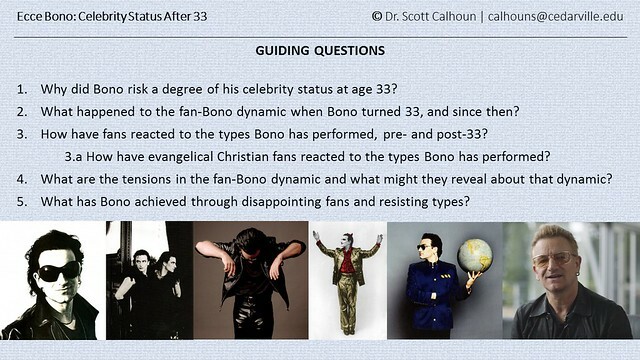 In U2’s Achtung Baby years, Bono has said he was inspired by the Irish poet Brendan Kennelly advice of “If you want to serve the age, betray it.” It would seem Bono is desperate for us to hold him, thrill him, kiss him and then kill him, but he's just as insistent that we don't hold onto him too tightly. And to get us to let go, is he willing to betray his fans? Would he speak out, or use U2's artistic voice, to make a statement that might even kill the spirit of fandom itself? Is he, then, our best or worst guide to wisdom? But what do we want? What revelation do we seek? How do we free ourselves to be ourselves? 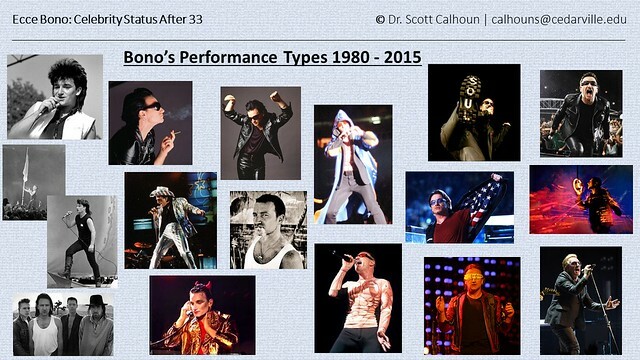 What could we be without Bono? What must we do to be saved?